Quartz is a stone of power, clarity and harmony. It is called the "Universal Crystal" because of its many uses. it can be found all over the world. These two necklaces feature an antiqued brass man in the moon crescent with a small, dangling quartz crystal. The first has quartz with amber and pink streaks. The back of the necklace is gold glass seed beads. The clasp and metal accents are antiqued brass. This second necklace also has antiqued brass accents. It features rock quarts which is a pure, clear form of quartz. The back of the necklace is clear glass seed beads. Mystical power: Quartz enhances energy and thoughts by absorbing, storing, amplifying, balancing, focusing and transmitting. It is beneficial for manifesting, healing, meditation, protection, and channeling. Excellent for harmonizing and balancing one's environment. A stone of clarity which dispels negativity and clears away negative energy. Used to purify and clarify on the spiritual, mental, and physical planes. Powerfully protective. Enhances spiritual growth, spirituality and wisdom. Increases inspiration and creativity. Helps with concentration, studying, and retaining what one learns. A stone of harmony because it balances energies, and is even helpful in romantic relationships. If you see things featured on my blog that you like send em an email, as not all of my work gets posted in my online store. I made several necklaces with this gorgeous stone for my show last weekend and most of them sold. But do not worry, I have more! Known as the Tempest Stone, pietersite is not only beautiful by very powerful. It is found in Henan Province, China, and Namibia, South Africa. It is a variety of Quartz, composed naturally of Tiger's Eye, Hawk's Eye and Jasper, and is characterized by an incredible chatoyancy (cat's eye effect or optical reflectance effect) and brilliance of life within the stone. The most common pietersite is gold but it is also rarely seen in red and even rarer is blue. Mystical power: Helps us to weather rough and stormy periods of our life and to build new order out of chaos. Aligns energy centers while providing grounding. Dispels illusion and assisting in recognition of the beauty of the soul. Promotes loyalty to self and to the ultimate experience of life. Allows one to see beyond the horizon, helping to support human courage, tenacity, and dauntless effort to both create and maintain beauty. Boosts self-esteem when worn consistently. It is especially empowering for creative people who lack confidence in their abilities. 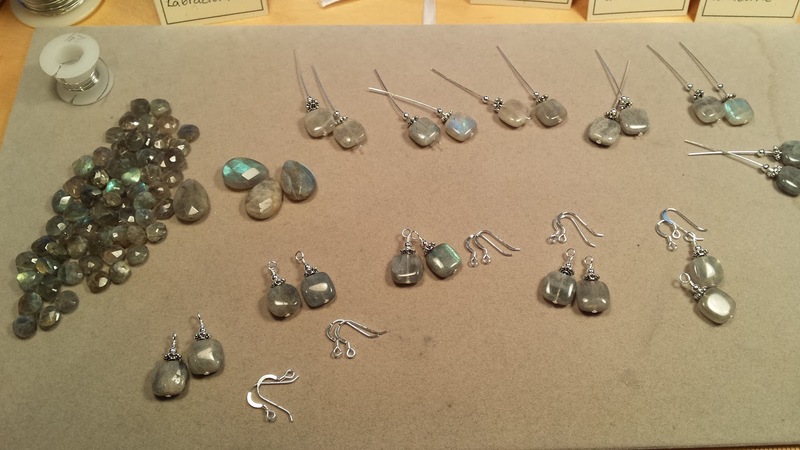 Labradorite is a stone of magic, power and good luck.We can all use one or two of those in our lives! This beautiful stone is found in Canada (Labrador, Newfoundland), Australia, Madagascar, Mexico, Norway, Russia and the USA. Healing Ability: Helps develop the hands' sensitivity, making it useful for physiotherapists and all who use the power of touch to heal. Helpful in treating eye and brain disorders, and to helps regulate metabolism and the digestive process. effective in alleviating bone issues, disorders of the spinal column and the wear and tear of the joints. Rheumatism and arthritis may also benefit from this stone's healing powers. Mystical Ability: Excellent for awakening one's own awareness of inner spirit, intuition and psychic abilities. Tempers the negative side of our personality, the traits and actions that rob our energy and may produce depression or shame. Allows you to see through illusions and determine the actual form of your dreams and goals. Stimulates enthusiasm and imagination. According to an Eskimo legend, the Northern Lights were once imprisoned in the rocks along the coast of Labrador. It is told that a wandering Eskimo warrior found them and was able to free most of the lights with a mighty blow of his spear. 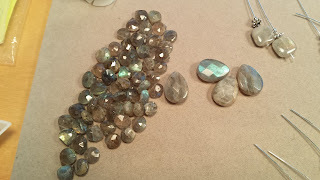 Some of the lights were still trapped within the stone, labradorite. Note: As always stone trivia is provided for curiosity only and is in no way meant to be medical advice.